I love fall! At this time of year there's always a feeling in the air that I can't describe, but it makes me happy. Maybe it conjures up contented memories from the past that I can't pinpoint, but anyway, it's a feeling that I like! Along with this time of year comes pumpkin patches, pumpkin baking, decorating fun, fall-themed cookies, and of course, Halloween! We all know that Halloween means candy, and I don't think there is a more iconic Halloween candy than candy corn! 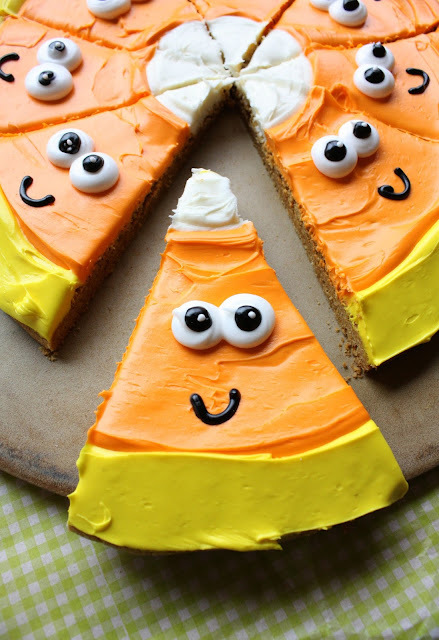 Last year I had the idea of making a candy corn cookie pizza, which I did (though it wasn't as cute as this one, if I do say so myself), and I only posted one photo on my facebook page and never did a blog post. Yesterday, I decided to finally use this Pillsbury, boxed pumpkin cookie mix (I could not pass it up on the sale rack for 75 cents!) that has been in my pantry for a short while. I'm so glad I did! 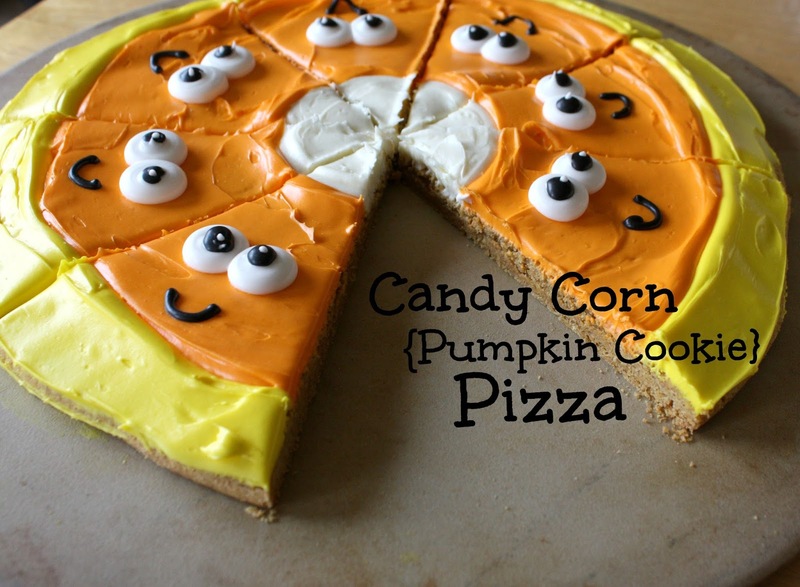 It was the perfect tasty base for my fall cookie pizza! My husband loved it too! I did use my own royal icing for the facial details, since I had some already made. This little guy is cute, but I ate him anyway. 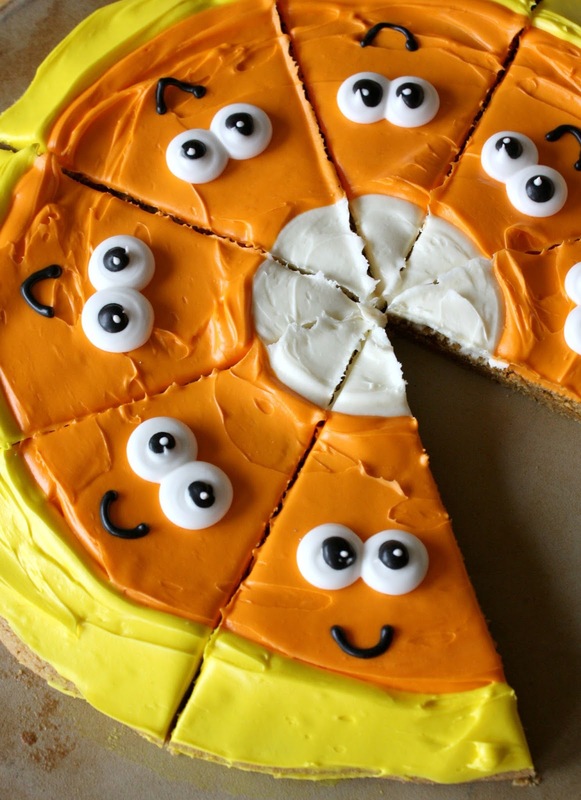 This cookie pizza would be such a fun Halloween party dessert, or fall birthday dessert (we have a few in our family, with another coming soon! ), or just make one any fall day to make it a little extra special. It's too easy, tasty and cute to pass up! 1. Mix cookie dough and plop it onto the middle of the round pan (I used a pizza stone). 2. Use your hands (just washed:)) to pat the dough into a big circle (I put a bit of flour on my hands to make it easier and not so sticky). 3. Bake according to directions on box or recipe (I had to bake it about twice as long as the box stated, for the giant cookie). Allow cookie to cool (keep on pan). 4. Tint some of the frosting orange, and some yellow. Keep a small amount white for the middle circle. 5. Put some of the white, untinted frosting in the middle of the cookie (I used a decorating bag with no tip) and spread with a small, offset spatula (or knife), into a circle. 6. 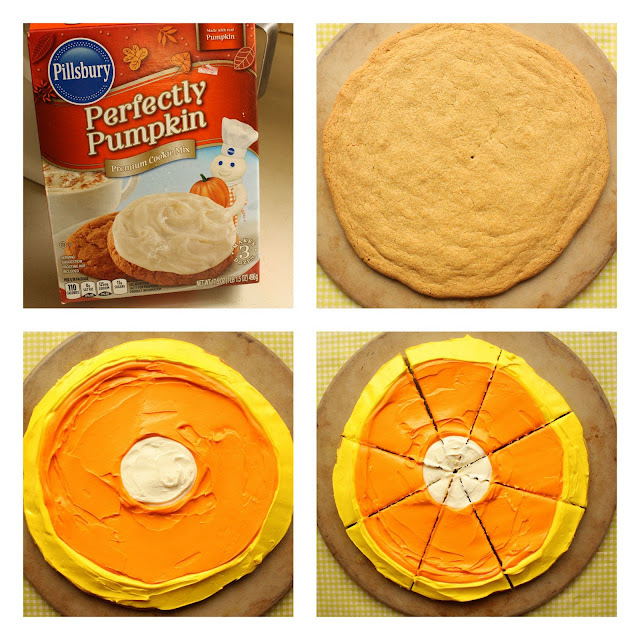 Spread the next portion of the cookie round with the orange icing. 7. Spread the yellow frosting around the outer edge of the cookie. 8. Decorate the face: I used a decorating bag and tip (#5 for the whites of the eyes), #2 tip for the black pupil and smile, and a #1 tip for the small white dot to finish the eye detail (another option would be to purchase candy eyes). You could use a plastic sandwich bag filled with the icing, and make a small cut in one of the corners to apply the facial details, if you don't have decorating bags/tips. I always love adding cute faces to my treats and I am in love with these cute candy corn cookies. So sweet! Wow, it's so cute, didn't even know that had that kind of mix! Thanks, Kim! I couldn't pass up this cookie mix for .75, and it's yummy too! Thank you so much, Karen! Have fun! Such an adorable seasonal treat! This is the most adorable candy corn cookies I have ever seen! Loe the cute faces! Pinning now! What a darling idea Sue! :D I'm so excited for Halloween and I bet you come up with some awesome cookies! The faces absolutely draw you in. Very cute. You could also make a cake and decorate it like this. Thanks for mentioning you have to bake it twice as long (approx.) when making a giant cookie. I love this! I too have a box of cookie mix that I got on the sale rack (I actually got it after last Halloween -- and apparently it's good until 2017), so I'm going to have to try this! Gotta love the sale rack! :) Thanks for your comment Erica, and happy baking! This is so cute, Sue. And a cookie that I could actually make =o) Pinned it for later!